RA / DEC ..................................... 02h:20m. / +57° 08m. Target details ......................... 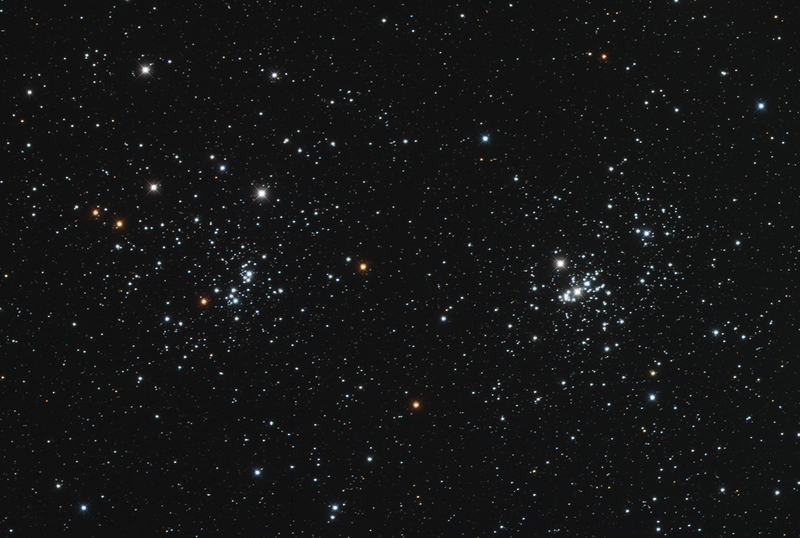 The Double Cluster (also known as Caldwell 14) is the common name for the naked-eye open clusters NGC 869 and NGC 884 (often designated h Persei and χ Persei, respectively), which are close together in the constellation Perseus. NGC 869 and NGC 884 both lie at a distance of 7500 light years. NGC 869 has a mass of 3700 solar masses and NGC 884 weighs in at 2800 solar masses; however, later research has shown both clusters are surrounded with a very extensive halo of stars, with a total mass for the complex of at least 20,000 solar masses. Based on their individual stars, the clusters are relatively young, both 12.8 million years old. 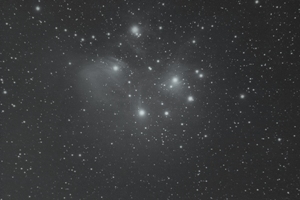 In comparison, the Pleiades have an estimated age ranging from 75 million years to 150 million years. There are more than 300 blue-white super-giant stars in each of the clusters. The clusters are also blueshifted, with NGC 869 approaching Earth at a speed of 39 km/s (24 mi/s) and NGC 884 approaching at a similar speed of 38 km/s (24 mi/s).Their hottest main sequence stars are of spectral type B0.